I posted this yesterday, but Blogger has been having some technical difficulties….so I wanted to make sure you all saw it. Thanks to all those who left comments yesterday…sorry for the repeat! If you are bumming that you weren’t able to make it to the Brimfield Flea Market that is the talk of the day on Twitter….don’t worry. Eddie Ross & Jaithan Kochar have cherry picked it and many, many more flea markets around the country to bring the “best of” to a 1 day only Pop Up Shop! 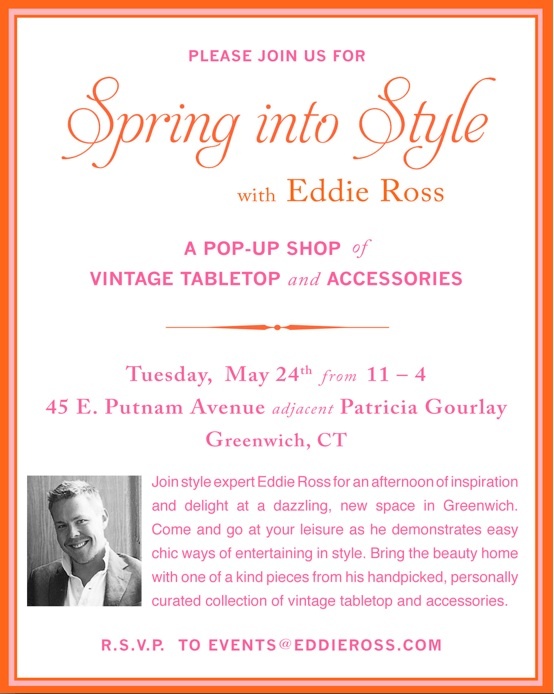 Join me in Greenwich, CT on Tuesday, May 24th to get a first hand look at their fabulous, vintage finds! They’ve done the hard work so that you don’t have to! Let’s raise a hand-cut crystal, vintage glass to that!! I am putting this down and am going to try my hardest to make it!!!!!! What a fun day…..and love any excuse to go to Greenwich! Thanks for the heads up. File this one under "Housefrou, Posts That Make Me Want to Become a"
Oh it DOES sound like fun – I have to be somewhere at 2 – perhaps I could come for a bit at the beginning!! Thanks for the heads up – hope to see you there but I'll see you Monday at Blogfest first!! Will definitely try to make it – wedding season is upon us! ahh! I wish I could go! I wish this happened last week! Sounds like so much fun. Will be there in spirit! I wish I lived in the area!! That would be a super fun and fabulous day! Enjoy! Wish i could be there. Love your blog! We're SO looking forward to seeing you (and everyone!) on Tuesday the 24th in Greenwich. The pop-up shop will be GORGEOUS and full of great tips for entertaining this season! I'll be there! It's on my calendar. I've already RSVP'd – it will be my first event with Eddie – I can't wait. And another excuse for us all to get together!! I'm going! I can't believe I figured this out. It will make up for missing Blogfest….